The Government has initiated a review of the Fire and Emergency New Zealand (FENZ) funding regime. The purpose of the review is to identify whether more suitable options exist for funding FENZ than the current levy on property insurance. The Government expects to release a public consultation document on this issue in mid-2019. Public feedback on potential funding arrangements for FENZ will then be sought. regulations for FENZ’s enforcement regime, and fire plans. The amendment bill will, among other matters, delay commencement of the new levy regime to 1 July 2020. The amendment bill is expected to be introduced into the House in late 2018, and to be passed before 1 July 2019. The draft levy regulations are being released now to give the public certainty of how the new levy regime will work. They are expected to be finalised when the new levy rate is set in 2019. The infringement offences and fire plans regulations are expected to be approved in late 2018. As part of the integration of New Zealand’s urban and rural fire services into Fire and Emergency New Zealand, Cabinet requested a review be conducted into the operations and performance of the New Zealand Fire Service (now Fire and Emergency New Zealand). The Operations and Performance Review (the review) was conducted in two phases by Price Waterhouse Coopers. closely examining the condition of assets and the level of investment that is needed in the rural fire services. On 20 December 2017, Cabinet agreed the policy for Fire Safety and Evacuation of Building regulations. These regulations will now be drafted and will go to Cabinet for approval as soon as possible. This discussion document was released by the Minister for consultation. It covers proposals for the replacement of the Fire Safety and Evacuation of Buildings Regulations 2006, and the development of offences and penalties. Public consultation ran for six weeks. Submissions closed on 8 September 2017.
information to be provided by levy payers when making levy returns. These regulations will now be drafted and will go to Cabinet for approval as soon as possible. The Fire and Emergency New Zealand Bill received Royal assent on 11 May 2017 to become the Fire and Emergency New Zealand Act. It establishes Fire and Emergency New Zealand as of 1 July 2017, and marks the most significant change to the fire sector for 70 years. Internal Affairs Minister, Peter Dunne, released a discussion document on new levy regulations as part of the reforms of the fire services sector. You will need to save the document to your PC and type in the fields. Email or post to the address below. The Government Administration Committee has reported back the Fire and Emergency New Zealand Bill. The Bill establishes a single, unified fire services organisation for New Zealand. The Bill now awaits a second reading in Parliament. Following an extensive review of New Zealand’s Fire Services, Cabinet agreed to a unified, national fire service that fully integrates New Zealand’s urban and rural fire services. The entity will be called Fire and Emergency New Zealand (FENZ). Cabinet also agreed that a comprehensive financial and operational performance review of the New Zealand Fire Service Commission be undertaken by independent reviewers to inform key funding and performance-setting decisions for the Commission. Independent reviewers have been selected though a competitive tender process in accordance with government procurement process. Internal Affairs Minister, Peter Dunne has today released a discussion document on new fire services regulations as part of the reforms of the fire services sector. You will need to save the document to your PC, type in the fields. Submissions close Thursday 18 August 2016. The Bill to modernise New Zealand’s fire services has passed its first reading and heralds the most significant change in the sector for 70 years. Internal Affairs Minister Peter Dunne has introduced legislation to combine New Zealand’s rural and urban fire service into a single organisation. Internal Affairs Minister Peter Dunne has announced funding of $303 million over five years to combine New Zealand’s urban and rural fire services into Fire and Emergency New Zealand from mid-2017. 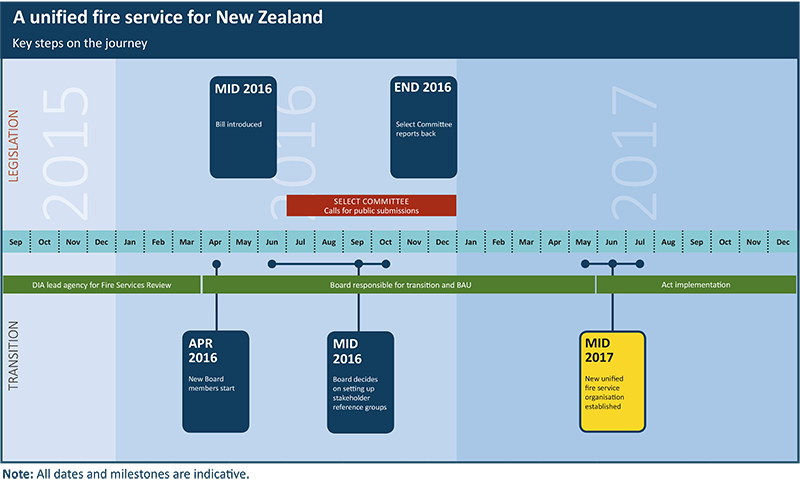 Fire and Emergency New Zealand will be set up in mid-2017. The initial transition work will focus on what must be achieved for the new organisation to be legally unified by that time as well as other important work necessary to get off to a good start. The dates on this timeline could change, depending on the Parliamentary process, but we will update this timeline if they do change and explain why. As the sector continues to work together to design Fire and Emergency New Zealand, it’s essential that you’re kept informed as things unfold. If you can’t find the information you need on these pages please ask your manager (if you are in the fire services) or email FireServicesTransition@dia.govt.nz. We will respond directly to you. The Minister of Internal Affairs Peter Dunne has released his Letter of Expectations to the Board of the Commission so everyone can see what the priorities are for both business as usual operations, and for the transition to the new organisation, Fire and Emergency New Zealand. The Minister of Internal Affairs Peter Dunne announced a new chair and new members for the Board of the New Zealand Fire Service Commission. Read more about the decision to amalgamate New Zealand’s fire services, resulting from the Fire Services Review. *This document is in Adobe Acrobat (.pdf) format. To read or print these files, you need to have the Adobe Acrobat Reader installed on your computer. You can download a free version from the Adobe site.